What do women have who are leaders in their own life? They have a plan. You can have a plan too. 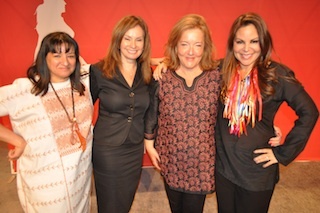 Last week in Las Vegas at the launch of The Adelante Movement, led by my friend media mogul, Nely Galan along with U.S. Treasurer Rosie Rios and world renowned author Sandra Cisneros, I shared the basics of what goes into writing a one page plan for your business or not-for-profit organization from a great book called The One Page Business Plan for Women in Business by Jim Horan and Tamara Monosoff. Tamara runs a wonderful organization, Mom Inventors, that helps Mom's bring their inventions to the marketplace. What is your vision? Really relax and think about this -- visualize it. What kind of business or organization are you building? How much money do you plan to make? Who is your ideal customer? Who do you want to work with? (Answer these and all the questions below using bullet points. If you are not sure how to answer some of these questions start talking to other business owners. Ask them how they would answer. Use answering these questions as an opportunity to do research using Google and your connections. Don't have any connections yet? Join The Adelante Movement today, sign up for business growth help with Count Me In, visit www.mominventors.com to buy The One Page Business Plan for Women book and CD and/or go to the Women's Business Center near you which you can find through the Small Business Administration). Why does your organization exist? What is the goal? What problem does it solve? How will it help or delight your ideal customers? Describe the benefit of your product or service. For example The Adelante Movement's mission is to unite and empower Latinas economically. What results are you going to measure? Sales, tweets, referrals? How are you going to know you are on the right track? Describe the work that has to be done to build your business. Prioritize this list of bullets and put completion dates by each item. It may take hours or weeks for you to finish this one page document but when you do you will have a much better idea of how you are going to move forward with your business and your life. Nely Galan always has a plan, which is how she ran a TV network at 22 years old, created hundreds of TV shows, built a real estate business and most recently launched The Adelante Movement. Make your plan. Believe in you.